Israel's Prime Minister issued an ultimatum to officials in Ramallah that they must choose between Hamas and peace with Israel. Prime Minister Binyamin Netanyahu on Monday responded to an agreement signed by Fatah and Hamas in Doha saying the Palestinian Authority "can't have it both ways." The agreement ends an impasse between the rival factions over who will head the interim unity government and will also allow Hamas and its terror confederates to be inducted into the PLO. 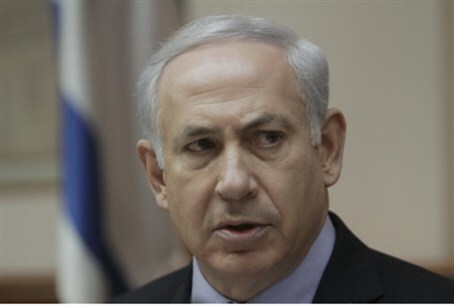 "I would like to say a few words about what was signed in Doha," Netanyahu said at the weekly Likud faction meeting. "Hamas is a terrorist organization that strives to destroy Israel, and which is supported by Iran." "I have said many times in the past that the Palestinian Authority must choose between an alliance with Hamas and peace with Israel. Hamas and peace do not go together. Over the past few weeks, Israel and elements in the international community have made great efforts to advance the peace process. "Not only does Hamas not recognize Israel and the [previously signed] agreements, it has not abandoned terrorism. It is continuing with terrorism and to arm itself in order to perpetrate even deadlier terrorism. "I say to Abu Mazen: You cannot hold the stick by both ends. It is either peace with Hamas or peace with Israel; you cannot have it both ways." Hamas, regarded as a terror organization by Israel, the European Union, and United States has rejected conditions by the Quartet for Middle East Peace that it recognize Israel's right to exist, formally abandon terrorism and violence, and to uphold agreements signed by previous PA governments with Israel and any other entity. Hamas has also said that any agreement signed with Israel would only serve as "a prelude to war." In December 2011 senior PLO officials adopted “a strategy based on continuous efforts along with the international community to secure full recognition and full United Nations membership, pursuing internal reconciliation, and keeping up the popular resistance." PA officials insist Israel accept the indefensible pre-1967 lines as borders for a PA state, release all Arab terrorists from its prisons, and freeze construction in disputed territories for a second time before talks can begin. They have also adopted a unilateral track at the United Nations seeking recognition of the PA as a full-member state along the pre-1967 lines in contravention of the 1993 Oslo Accords which prohibits unilateral moves from either side. Israeli officials say the PA preconditions are a fait accompli to forestall talks and are trying to shift the blame onto Israel for their own refusal to come to the table. They also say Israel is ready to return to to the table without preconditions from either side "anytime, anywhere." Many critics say the government's response to the winds blowing from Ramallah has been sluggish and that officials in Jerusalem have yet to absorb that the once vaunted 'Peace Process' is at an end.